There are several different kinds of Celtic designs and tatting has focused on the interwoven type. There is also a significant tradition of spirals, usually in groups of three that has not been investigated by tatters very much. Spiral Celtic designs are not as familiar to most people as the interwoven style is, but I am very intrigued with them. 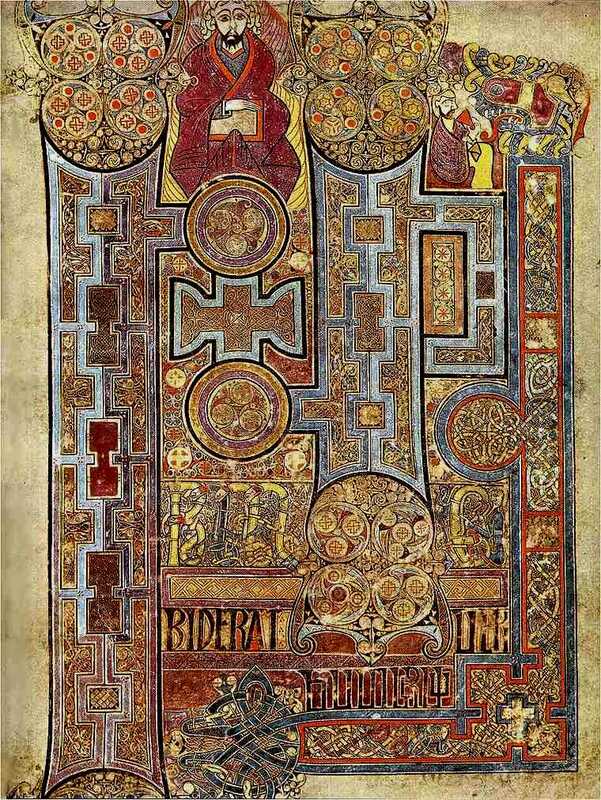 This page is the first page of the Gospel of Matthew from the Lindisfarne Gospels c. 700 AD and has the interwoven motifs more prevalent, including animal figures whose bodies and limbs are extended to be able to interweave them to the extent that it is difficult to tell what sort of animal they are. So, what has tatting taken away from all of this? The first attempts to reproduce an interwoven Celtic design consisted of making separate pieces that could be fitted together and then bound by a final row tying the interwoven parts together. The do not produce the look of classic Celtic interweaving, but they are truly interwoven and require no special tools. Click here to go to the pattern and see the method of constructing the interweaving of her bookmark. Writing as Rozella F. Linden (a nom de plum honoring her beloved grandmother), Ruth expanded Celtic Tatting by working long chains and weaving Celtic knots with them, usually using a paper clip as the weaving tool that could fit into small spaces as the weaving progressed. She also designed other patterns in the multiple parts method used by LaRae. A third invention of hers was to make a long chain and pull it into a spiral, arranging the crossings of the chain so that a second straight chain could interweave with the coiled chain. Ruth has a blog dedicated to Celtic Tatting. An amazing form of Celtic tatting was invented by German tatter Yvonne Reypa. She calls it CYK and it involves interweaving large rings as they are made. This method requires a tool that can slip through the small openings of the rings as the weaving progresses. Here is an English translation of her method. This is my attempt, which I accomplished by using rods from Tinkertoys as a thin celtic tatting shuttle. The slits in the ends worked quite nicely, like a netting shuttle. Which brings me to my contribution to the enduring puzzle of making Celtic interwoven patterns in Tatting: a better tool and my achievement of a type of Celtic interweaving that has always been my objective. My thought had been to make a continuous woven circle. The process was to find a way to not end a round where it began until all the weaving was done. It turns out that having one less attachment point than the number I need to go around 2, 3, or 4 times was the solution. Now to move on to more interesting formations that include these forms that I understand better now. WHAT an interesting and inspiring post. Thanks for waking up brain cell 3 on this dull and dreary Sunday morning. Thanks for this wonderful explanation, Patty! I do have two of your shuttles, but I haven't tried them yet. I feel motivated now! This is a wonderful post with all the links! Thank you! I love the look of Celtic tatting and have completed a few projects that include it. Would love seeing more Celtic patterns online! I love your little slim shuttles. I would think needle tatting would lend itself perhaps more to Celtic than the traditional shuttles as well. Thank you for the information. I was unaware of Yvonne's method of Celtic tatting. I also have a pair of your shuttles but haven't used them yet. I will have to find them so I can try out your motifs. THANK YOU for writing such an informative article with well-chosen illustrations. I discovered that I had the wrong file posted for the Skip-3-Celtic. It was incomplete. I found the finished file and updated the file here on the discussion. It may make more sense now. Really informative and inspiring article! Thank you. A great lesson of celtic tatting. Thank you, Patty. I have done some Celtic tatting, and after the first one which was a freebie egg type design, I just fell in love with it. I would definitely like to learn more. I even have a book with Celtic diagrams, but have never used it yet. Maybe now..! PS...I just noticed the tools. I have never had to use anything different with what I have made so far, but these patterns a bit different, so...time to do more investigating! I have done mainly the interwoven Celtic tatting, but I also want to try the other kind also. I have some patterns already, and am anxious to try it also. I'm still searching for more patterns, and have a book or two also.